Herb Robertson is an avant-garde jazz trumpeter, flugelhornist and composer. He combines a thorough command of traditional and extended techniques with a prodigious imagination. Born in 1951 in New Jersey, he began to play trumpet at age ten in his elementary school’s fifth grade class. He was introduced to jazz two years later by his junior high school music teacher, who turned him on to the music and recordings of Miles Davis, Donald Byrd, Freddie Hubbard and other great jazz trumpeters. In his early teens, Robertson began collecting jazz and classical records, intensely listening to and absorbing all styles, from Louis Armstrong to the avant-garde, with special emphasis on the era’s hard-bop style of jazz. In high school he led a quintet that played dances and specialty concerts. After high school, during the years 1969-73, he attended the Berklee College of Music in Boston as an instrumental performance major, a period in which his improvisational skills became highly developed. In 1973 he left Berklee to go on the road in Canada as a lead trumpeter with various jazz-rock cover bands. In 1975 Herb Robertson had to quit playing music for a short time when the strain of performing nightly in loud jazz-rock bands caused him to temporarily lose his trumpet chops. Robertson altered his playing style, becoming a more lyrical and explorative artist. In 1976 he started a rehearsal big band, while also playing in smaller ensembles with some of the more creative avant-garde musicians of New Jersey. He then met alto saxophonist Tim Berne in the late 1970s where he first gained attention for his playing with Berne’s groups during the years 1981-87. His lyricism, tonal distortions and use of mutes looked back to jazz’s past, while his freer improvising was quite futuristic, fitting in very well with Berne’s music and passionate alto playing. During this period he also became a member of long time collaborator and bassist Mark Helias’ groups. Robertson recorded his initial leader album in 1985, and has since appeared on over 100 recording projects. As a leader he began putting together his own adventurous bands in 1986 and has recorded for the JMT, Splasc(h), Clean Feed, Leo, Nottwo, CIMP and Cadence labels. His groups since 1987 include The Double Infinitives, the Herb Robertson Brass Ensemble, The NY Downtown All-stars and various groups with Dominic Duval, Jay Rosen, Paul Smoker and Phil Haynes. 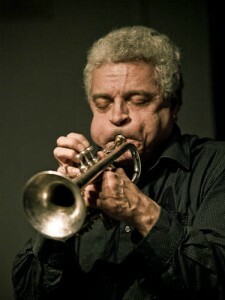 He has worked with many of the major names of the avant-garde and modern mainstream jazz including Anthony Davis, Bobby Previte, David Sanborn, George Gruntz, Bill Frisell, Paul Motian, Dave Ballou, Lou Grassi’s Po’ Band, The Fonda–Stevens Group, Nexus, The London Jazz Composers’ Orchestra, Barry Guy’s New Orchestra, Michael Moore, Terry Jenoure, Andy Laster, Joe Lovano, Judi Silvano, John Lindberg, Gerry Hemingway, Zlatko Kaucic, the Satoko Fujii big band, Marc Ducret, Simon Nabatov, Mark Feldman, Steve Swell, Pierre Dorge’s New Jungle Orchestra, Mark Solborg, John Zorn, Phil Haynes, Paul Smoker, Roswell Rudd, Jim Yanda, Elliot Sharpe, the Klaus Konig Orchestra, Rashied Ali, Ray Anderson, Paul Motian, Dewey Redman, Evan Parker, Agusti Fernandez, Jean-Luc Cappozzo, Frank Gratkowski, Simon Nabatov, Michiel Braam, Matthias Schubert, Mark Dresser, the Charlie Haden Music Liberation Orchestra, Satoko Fugii, Wilbert De Joode, Wolter Wierbos … among many others. He has been cited as an important influence by trumpeter Dave Douglas. Herb Robertson, who has composed music for dance, theater and documentary films, also plays valve trombone, tuba, the Eb alto horn and “little instruments” and has performed at almost all European, American and Canadian festivals and American jazz clubs. In 2005, he, along with Dr. Ana Isabel Ordonez, started their own record label to promote avant-garde jazz and new music in its most extreme forms. Both Herb Robertson and Ana Isabel Ordonez became business partners and named the company Ruby Flower Records, releasing some great new music recordings. Herb Robertson left the company in 2009 to concentrate more on his own personal creative endeavors. Whether it’s complex large group arrangements or free form duets, Herb Robertson brings his wide knowledge of jazz history along with his original voice and adventurous spirit to each session.